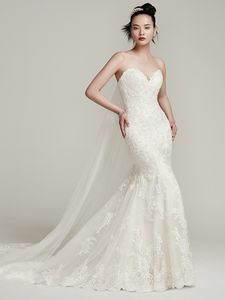 Description: Lightly embellished lace and the dramatic scalloped hemline and train create a simply stunning fit and flare wedding dress. Finished with sweetheart neckline and corset closure or covered buttons over zipper closure. Detachable lace cap-sleeves and veil sold separately.